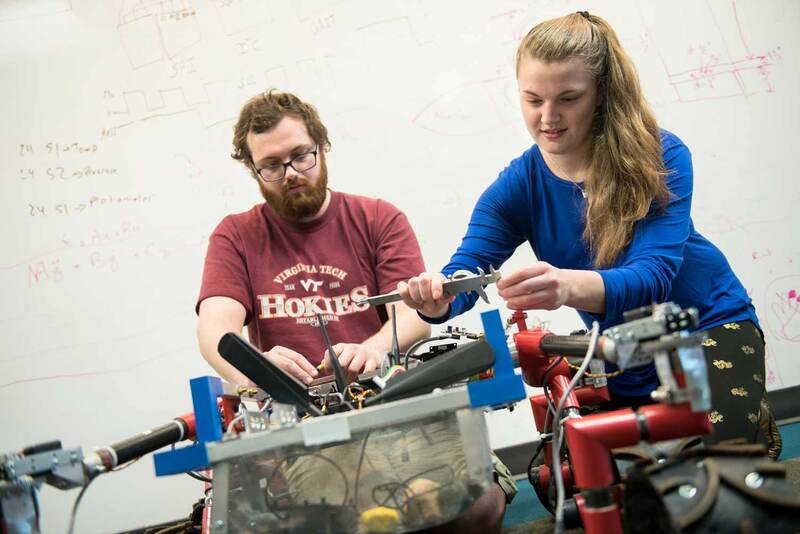 The Virginia Tech College of Engineering pushes the boundaries beyond classroom learned knowledge by applying a hands-on, multidisciplinary approach to preparing students to be highly recruitable problem solvers and leaders. For almost 150 years, the Virginia Tech College of Engineering, the fifth largest producer of engineering graduates in the nation, has been conducting life-changing research, educating the leaders of tomorrow, and solving challenges that plague our world, like Alzheimer's disease, water contamination, and cybersecurity. As a result, the college is ranked nationally — 8th in research expenditures by the National Science Foundation. U.S. News & World Report’s 2019 survey ranks the College of Engineering No. 13 for its undergraduate program, moving the college upward in this national ranking against peers and aspirational peers, ahead of all other Virginia engineering programs. The college's rigorous curriculum, hands-on learning, and industry engagement produces graduates who are poised for success — ready to work, innovate, and lead. The Virginia Tech College of Engineering is the largest and most comprehensive engineering program in the state of Virginia, with 384 tenure and tenure track faculty across 18 areas of undergraduate and graduate study, teaching approximately 11,000 students, covering a myriad of engineering disciplines in undergraduate and graduate disciplines from mining engineering to nuclear engineering. The college's youngest faculty are poised to further research in critical areas, collectively earning 11 National Science Foundation CAREER awards and five Young Investigator awards — a record high in college and university history in 2018. Virginia Tech engineering continues to be sought out destination for an engineering degree, seeing a 20 percent increase in applications this year. The college offers 14 undergraduate degree-granting engineering majors, 16 doctoral, and 19 master's programs in 18 areas of study and is comprised of approximately 384 tenured and tenured track faculty across 12 departments and two schools. Virginia Tech engineering supplies more than 50 percent of the engineers to Virginia’s work force. In the 2017-18 academic year, the college graduated 1,784 undergraduate engineering degrees, which is more than 50 percent of total degrees in the state of Virginia. The college continues to be on the forefront of innovation and research, working in disruptive technology areas that include: autonomous systems and robotics, cybersecurity, cyber physical systems, the internet of things, data analytics and decision sciences, injury and occupational biomechanics, manufacturing materials and systems, energy engineering and science, sustainable infrastructure and construction, transportation and logistics, turbomachinery and diagnostics, corrosion and water, and wireless communications and security.